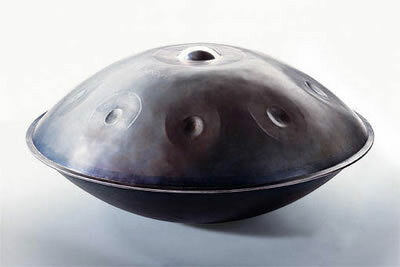 Reto Weber, a Swiss percussionist visited PANArt Ltd in November 1999 and showed his Ghatam playing technique: he said he dreamed of a steel pot with different notes to play with the hands. The principal components were then made: two high quality hemispheres of steel to be stuck together: one without notes and the other one tuned to a scale. And this was the birth of the Hang. The Hang produces a soft, pleasant, relaxing, meditative and very original music. Nowadays, it is mostly used solo even though Hang players increasingly work with other musicians or artists, forming bands and other types of artistic collaborations. The Hang has also been integrated in symphonic orchestras, classical formations and famous bands such as ‘Bjork’ or ‘Dead can Dance’. Besides the obvious musical use of the Hang, there is also an increasing interest of the ways in which the appeasing sounds of the Hang can be used for therapeutic purposes. the hand: and this is how it is meant to be played, with the hands and only the hands. the curves of a mountain: the top part of the Hang actually visually looks like a small mountain. Since its first public appearance in 2001 at the Frankfurter Musikmesse, the Hang has won the hearts of musicians and listeners from all around the world.